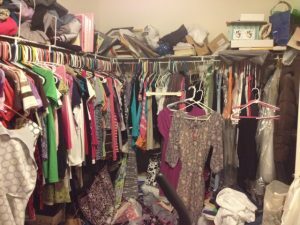 This is the second in a 3-part series about how to clear your clutter and rediscover the joy of space. We’ve based it on the book, The Gentle Art of Swedish Death Cleaning: How to Free Yourself and Your Family from a Lifetime of Clutter, by Margareta Magnusson. In Part 1 of this series I gave you some practical tips and resources on helping your aging parents (or yourself!) begin the process of downsizing. I suggested that you start with cleaning out the storage unit and stopping junk mail. How did you do? Don’t feel bad if you didn’t complete it, the important thing is to create a plan, and make continual progress on the plan. And there’s no shame in reaching out and asking for help from a professional! This month let’s talk about clearing out closets and redistributing clothes that no longer fit, are out of style or in need of repair, that haven’t been worn for a few years or especially for the elderly, may not be as functional as they once were. Even clothes can have sentimental value – the vest knitted by your late Mom, the sweatshirt in support of your favorite team. If they’re no longer usable, though, consider saving the memories with photos, which take up a lot less space! Here’s a simple process for downsizing that Swedish Death Cleaning author Magnusson suggests. 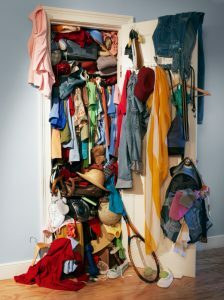 Sort all your clothes into two piles as follows: Pile 1 is for clothes you want to keep. Pile 2 is for clothes you want to get rid of. Look through Pile 1 and pull out items that require small adjustments or dry cleaning. Put the rest back in the closet. Then make the repairs and dry clean the remaining items before putting them back your closet. This is your new, downsized wardrobe. Give away, donate or recycle the clothes in Pile 2. Give away. Consider offering family members or friends the opportunity to repurpose gently-used clothing that no longer fits. Maybe there’s a sweater you rarely wear that a friend has always admired. This is a chance to see it go to a loving home. Donate. There are many charities that accept clean, gently used clothing. Dress for Success partners with corporations and professional organizations to hold donation drives for career appropriate apparel and accessories. Goodwill is a nonprofit organization with locations all over the country. They accept a variety of donated items, including clothing. The Salvation Army accepts donations at their stores and will also pick up your donations for free. The Salvation Army also has a handy Donation Valuation Guide. Local homeless shelters, crisis centers and churches also often accept donations of clothing to help the local community. Recycle. Resist the temptation to just throw clothing away, even if it’s torn and faded. It clogs up the landfill. Not only that, decomposing clothing releases methane, a contributor to global warming. Also, the chemicals and dyes in fabric can get into the soil, and thereby contaminate both surface and groundwater. Recycling textiles is a much better and environmentally friendly option. Take the clothing that’s not suitable to give away or donate to charity to your local material recycling bin. Earth 911 has more information and a Recycling Locator (by zip code). And consider giving used linens to your local animal shelter. So that’s your assignment for this month. Declutter the closets and give those unused clothes a new lease on life! And remember, if your parents are ready to downsize or are preparing for a move and you would like some professional help or advice, please contact me at 408.318.0828 or minda@loveandorder.net.